This is a circa 2007 JUMBO AQUANAUT Patek Philippe 5167A measuring a whopping 40mm. across in shimmering stainless steel. The soft rubber band with PATEK buckle is very supple. This band will fit a 6.25 inch wrist as it was cut by the owner, who wore this watch less on less than 10 occasions. 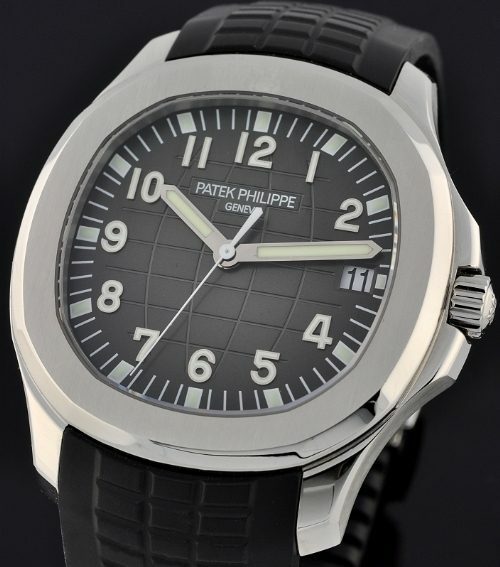 New rubber for this watch is easy to acquire from Patek if you have a larger wrist. I have adjusted the price accordingly. The entire watch is “like new” with only the slightest surface hairlines from gentle use. The crystal is sapphire. The automatic winding Patek Philippe Caliber 315SC, 21 karat gold rotor, 29 jewels, power reserve approximately 50 hours is visible through the sapphire case back. Box and papers included. This truly is one of the finest of the Patek Sporting watches.